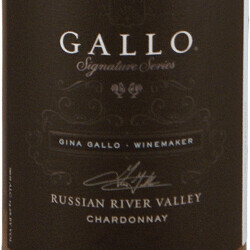 The 2010 Gallo Signature Series Russian River Valley Chardonnay ($30) is sourced from the Laguna Ranch vineyard, the first vineyard purchased by Ernest and Julio, back in 1977. At that time, there was no AVA there – it was vinis unknownis for the most part. I don’t know if the current vines date back that far, but they have undeniable power and charm. This wine, loaded with tropical fruit flavors, moves well beyond the buttery/fruity California style. The alcohol is listed at a comfortable 14.5 percent, and the wine has marvelous poise and balance, exceptional length, and tastes just as good if not better on the second day. The 2008 Gallo Signature Series Napa Valley Cabernet Sauvignon ($40) includes small amounts of Petit Verdot and Petite Sirah, all sourced from the rather cool William Hill and Monte Rosso vineyards. Cherry and cocoa rule the palate, which is fresh, flavorful, and modestly-proportioned. A second chardonnay, sourced from the Two Rocks vineyard in the Sonoma Coast AVA is also in the works. This will be more in a mineral/racy style, fermented largely (or possibly entirely) in cement tanks, says Gallo. That will come out next spring. As part of an ongoing program to consolidate the “Family” offerings, Gallo says the single vineyard Gallo Family wines and the reserves will be eliminated. There will be just two tiers – an Estate tier, and the Signature Series. This latter will be sold principally on-premise and in specialty retailers, not grocery stores. Given the focus on the legacy of both vineyards and family, I asked Ms. Gallo about plans for the recently-purchased Columbia winery here in Washington. She apologized for not yet having made a visit to the facility, but promised to do so soon. Certainly there are few, if any brands in the Northwest with a comparable legacy. As I first noted in this blog when the acquisition was announced, there is reason for optimism. I very much enjoyed my conversation with Gina Gallo, and I look forward to a meeting in person as soon as her travels bring her this way.